The shortest east-west US highway in Pennsylvania is ironically the longest in the United States. The route has not changed significantly since it was signed in 1926. The first change to take place on the highway was the widening from the Ohio state line to West Springfield, Fairview to the Millcreek Township line in 1938. Two significant changes took place in 1946. Widening took place between West Springfield and Eagley Road, the Fairview Township line and Asbury Road, PA 531 and Bartlett Road in Harborcreek, and in North East. Also, 26th Street was extended and Broad Street was built. Prior to that year, the designation used East Avenue to connect Buffalo Road and 26th Street. In 1952, the route was widened between Eagley Road and Girard. 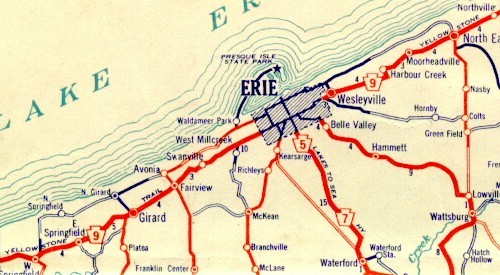 In 1954, widening took place from Girard to Fairview, Asbury Road to PA 299 and Yoder Drive to the City of Erie line. A year later the gap between PA 299 and Yoder Drive was widened as was the alignment from Wesleyville to PA 531 and Bartlett Road to North East. In 1958, a median was installed on the route from the Ohio state line to PA 5, Eagley Road to PA 18 South, Girard to Erie, Brandes Avenue to Buffalo Road, Wesleyville to PA 531, and Bartlett Road to Cemetery Road. In 1970, construction began from North East to I-90 to widen and install a median. The project was completed in 1971 and left the I-90 to New York state line section as the longest less than four lanes in width. Entrance: Ohio state line two miles west of West Springfield. Entrance: New York state line four miles east of State Line.